In conclusion — and I’m gonna keep this brief because it’s Flannel Friday, and y’all should be checking out some awesome flannelboards right now — themeless storytimes may not be for everyone. But I’m having lots of fun with them right now. I may not always stick to themeless storytimes. I mean, every now and then you just gotta do a bugs storytime or something, you know? But for right now, themeless storytimes are working really well for me. What about you? Do you do themeless storytimes? If so, what are some of the pros/cons you’ve experienced? As I mentioned before, I like to start off my theme-less storytimes with some of my favorite books that just so happen to be a tad longer than the other books I pull for storytime. Below are some of my favorite first books! I just want to mention that as I was typing this, I realized that this storytime has a lot of similarities in it! It starts and ends with books about bedtime. The song book has a lot of movement involved, and the movement book has a song-like rhythm to it. And of course the rhyme cube landed on Itsy Bitsy Spider on the day that I was planning to do Spider on the Floor as an activity. First Book: Like so many other storytime providers, I tend to read the longest book first. These first books are usually in rhyme, or have some great illustrations, or a great story. But, most of all, they’re books that I absolutely 100% love! First Activity: When planning storytimes, I just grab random activities that I really like. Usually these are flannelboards, but they can also be songs/puppets/STEM or any combination of those. Occasionally the activity will tie in with one of the books I’m reading, and if that’s the case, I’ll make sure to to the activity before or after that book. But most of the time it doesn’t matter when I do an activity, so I just grab whatever I’m in the mood for. Song and/or Short Book: I really like singing books, so I try to have at least one book that can be sung in storytime. Pete the Cat is my favorite, but I’ll read/sing just about any book that has a good tune (bonus points if children sing along though). If I can’t find a good song book that appeals to me, then I will choose a short book that’s funny or has lift the flaps or something of interest. Rhyme Cube: Another tradition that I brought over from my themed storytimes. The only difference is that I usually don’t have to roll the cube more than once anymore. Movement Book: By this time in storytime, kids are getting antsy, so I always try to have a story that incorporates movement. Jan Thomas’s Can You Make a Scary Face is my absolute favorite. 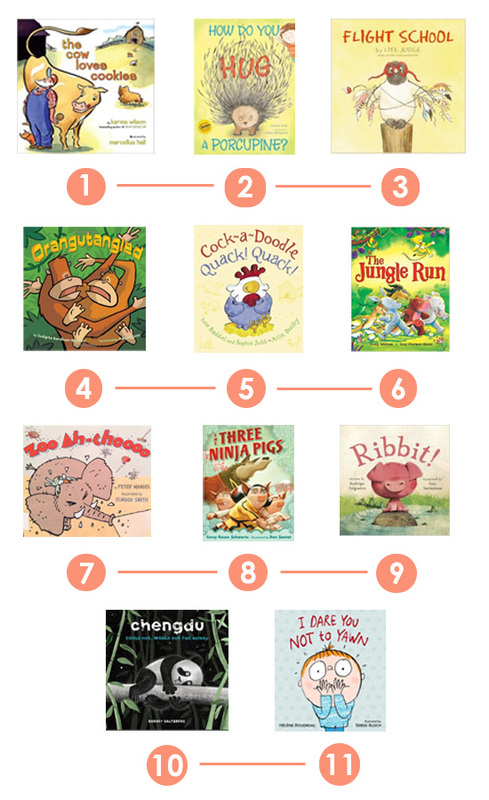 Other movement books that work well include From Head to Toe by Eric Carle, Shh! We Have a Plan by Chris Haughton, and Faster! Faster! by Leslie Patricelli. Short Book: Since the movement book is kind of like an activity, I go right into another book. It’s usually a short one, and, like I mentioned before, it tends to be funny or have some sort of interactive element such as lift the flaps. Second Activity: Then I do another activity. Again, not picky about what kind of activity. I usually just pick whatever I’m in the mood for and whatever is most appropriate for the crowd. Calm Down Book: I like to end things with a book that’s very short and calming. Keith Baker’s stuff is good, and I also used Helen Frost’s Step Gently Out before. I’m sure kids probably think these calm books are kind of a let down after all of that movement and giggling, but I like to think that the parents appreciate it. Closing Rhyme: We officially end things with the closing rhyme. Again this is consistent with how things have always been done. Once storytime is officially over, I tell parents that they can check out any of the books that I’ve read or that are on display in the room (and I always feel very happy when the books get checked out). I also turn on some fun music while people are browsing books. If I used a puppet in storytime, I will wait with the puppet beside the storytime door so that children can say goodbye to the puppet. Once everyone is out, I turn off the music, clean up, and storytime is over. *I also want to note that while I didn’t list a specific spot for early literacy tips, I tend to sprinkle those in as I’m reading or doing activities. FREEDOM! 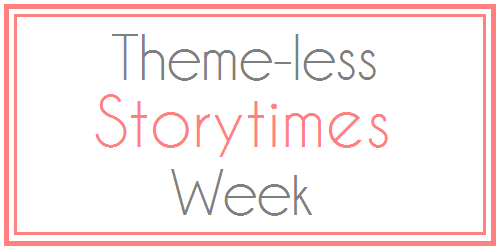 By giving up storytime themes, I’m able to choose whichever books, songs, activities, ect. that I want! Because I’m able to choose what I want, I’m able to choose things that I really love. Long gone are the ‘meh’ books and activities that I would throw in to stick with the theme. And by choosing things that I really love, my energy level and enthusiasm for the storytime increases, and it shows! Parents and children get excited simply because I’m excited. I’m able to gather a lot of books and activities for each storytime, which makes it easier for me to adjust storytime based on the crowd. I don’t know about your libraries, but preschool storytime is more like family storytime at my library. Most weeks we’ll get an equal number of preschool-aged children and toddlers with a few babies thrown into the mix. When I was doing themes, it was sometimes hard to find enough books and activities that were suited for a variety of ages, and I often found myself thinking on my feet to accommodate the various ages (which sometimes resulted in me doing the rhyme cube 3 or 4 times). But now I bring a whole big stack of books, flannelboards, songs, and activities into the storytime room. The ones I don’t use, I save for the next storytime. It’s amazing! It takes less time to plan (usually). The first day I decided to go themeless, I spent about a grand total of two minutes walking through the picture book section, pulling some of my favorite books. I then walked to my cubicle area, opened my flannelboard/activity drawer and picked out a few. The whole thing took about five minutes. Like I mentioned above, any books or activities that I don’t do in storytime go into the next storytime I do. So when storytime is over, I have half of my next storytime all ready to go. All I have to do is pull an extra few books and maybe an activity or two and voila! If you only do your favorite books and activities, your pool of things to choose from grows smaller. I’m lucky in the sense that I have a lot of favorite books and activities. This added on to the fact that I only do storytime once or twice a month means that it’ll be quite awhile before I run out of things that I love (and by then, enough time would have passed for me to start repeating things). But if I was doing storytime every week, I would probably have a problem. Lack of structure. While it’s freeing to not be limited to themes, after my second themeless storytime, I started grasping for some kind of structure. (If I were a character on Friends, I would be Monica. You might not have this structure problem if you’re a Rachel or a Phoebe.) I found myself creating some semblance of structure by the types of books I read (see the next post, The Method to My Madness). And so far it’s working out okay. The parents may not like it. This isn’t a problem that I’ve actually encountered yet, but I can see it happening if parents are used to themes. So many of us do storytime at my library, and we all have different styles, which means the parents are used to every storytime being a little bit different. And I know some of my coworkers occasionally do a themeless storytime just to liven things up (or because they have a cold and are in no mood to actually plan a themed storytime…we’ve all been there). So my storytime parents are used to this nonsense and just kind of go with the flow. But if you do themes every week and suddenly stop, I can see some parents reacting negatively to that. But they’ll get over it. Especially when they see how much fun their kids are having. And that’s all I can think of right now. Do you do theme-less storytimes? If so, what are some of the pros or cons for you?